PT Indosat Tbk - Indosat or more popularly called "Indosat Ooredoo" is a leading and reputable telecommunication services company in Indonesia. Indosat Ooredoo has its business activities focused in three sectors: cellular, fixed data and fixed telecom. Indosat Ooredoo is positioned inside the top three of cellular operators in Indonesia. As of December 2015, Indosat Ooredoo maintans 69.7 millions of total active cellular subscribers. Indosat Ooredoo is a key subsidiary company of Ooredoo Group (previously known as Qatar Telecom), a leading telecommunication services company in Middle East region. As of December 2015, the majority of Indosat Ooredoo’s shares are owned by Ooredoo Group (65%). Another 14.29% are owned by the Government of Indonesia (14.29%) and public (20.71%). 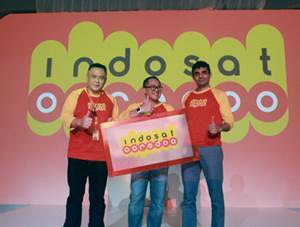 Headquartered in Jakarta, Indosat Ooredoo now has 10 areas, 72 sales areas, 102 sales clusters, 29 MPC and 169,303 outlets throughout Indonesia. Indosat Ooredoo also supported by 5 subsidiaries and 5 affiliated subsidiaries. In term of financial performance, Indosat Ooredoo has recorded a good performance in 2015. According to Indosat Ooredoo Annual Report 2015 as quoted by JobsCDC.com, Indosat Ooredoo reported total consolidated revenue of Rp 26,769 billion in 2015. This figures reflected a 11% growth as compared with Rp 24,085 billion in 2014. EBITDA increased 14% from Rp 10,033 billion in 2014 to Rp 11,473 billion in 2015. Final year undergraduate students or fresh graduate (maximum 6 months), majoring in the following discipline : Electrical Engineering, Telco Engineering, Industrial Engineering, Civil Engineering, Computer Science, Information Technology, Information System, Architecture, Mathematics, Statistics, Psychology, Economics, Business, Finance, Accounting, Management, Public Relation, Graphic Design, and Library Science. Actively involved in organization / community. JobsCDC.com now available on android device. Download now on Google Play here. Please be aware of recruitment fraud. The entire stage of this selection process is free of charge. PT Indosat Tbk - Fresh Graduate Internship Program Indosat Ooredoo July 2016 will never ask for fees or upfront payments for any purposes during the recruitment process such as transportation and accommodation.